Mr. BluBlue has a light blue "crelly" base with white square and diamond glitter, satin purple glitter and pink circle glitter. I used 2 coats with top coat of Seche Vite. It's no secret I'm a huge blue fan, but there is just something about this base color that is just simple and stunning. It maybe the combination of being a "crelly" and light blue, I'm not sure but I just can't get how amazing it is on it's own! The soft glitter mix in Mr. BluBlu only makes this polish ten times even more amazing! Formula was perfect and gave me no problems. Mr. P contains neon pink hexes and hearts, satin purple hexes and satin mint green hexes and squares all in light pink base. All nails are 3 coats with a top coat of Seche Vite. The Night Circus has a slightly tinted blue base and a mixture of holographic and neon glitters. Except for my ring nail, I used 1 coat of The Night Circus over 2 coats of Initial Lacquer Arctic Night. My ring nail is 2 coats of The Night Circus over bare nail and all nails have a top coat of Seche Vite. 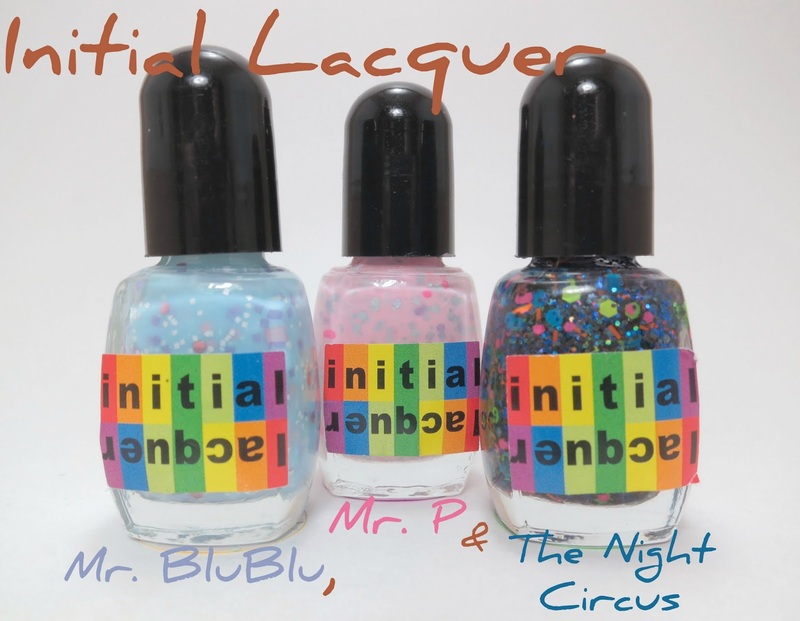 Buy Initial Lacquer on Etsy. Also, make sure to follow Initial Lacquer on Facebook and Tumblr to stay updated on new colors coming out. Iris has some awesome polish combinations, so make sure to check them out!